Chanda, R., Kanta Nath, L., Mahapatra, S. (2009). Formulation Development of Oral Mucoadhesive Coated Terbutaline Sulphate Tablets Using Some Natural Materials Extracted from Edible Fruits Available in India. Iranian Journal of Pharmaceutical Sciences, 5(1), 3-12. Ranabir Chanda; Lila Kanta Nath; Sontosh Mahapatra. "Formulation Development of Oral Mucoadhesive Coated Terbutaline Sulphate Tablets Using Some Natural Materials Extracted from Edible Fruits Available in India". 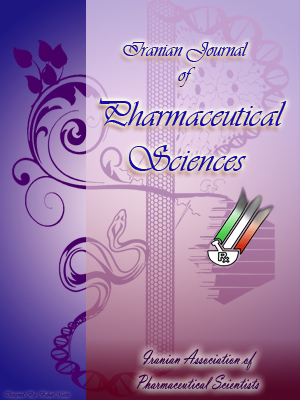 Iranian Journal of Pharmaceutical Sciences, 5, 1, 2009, 3-12. Chanda, R., Kanta Nath, L., Mahapatra, S. (2009). 'Formulation Development of Oral Mucoadhesive Coated Terbutaline Sulphate Tablets Using Some Natural Materials Extracted from Edible Fruits Available in India', Iranian Journal of Pharmaceutical Sciences, 5(1), pp. 3-12. Chanda, R., Kanta Nath, L., Mahapatra, S. Formulation Development of Oral Mucoadhesive Coated Terbutaline Sulphate Tablets Using Some Natural Materials Extracted from Edible Fruits Available in India. Iranian Journal of Pharmaceutical Sciences, 2009; 5(1): 3-12. Mucoadhesive polymers that bind to the gastric mucin or epithelial cell surface are useful in drug delivery for the purpose of increasing the intimacy and duration of contact of drug with the absorbing membrane. Several synthetic polymers are in use for this purpose. Since the biodegradability of the synthetic polymers are questionable, in this investigation, an oral mucoadhesive controlled delivery system has been developed for terbutaline sulphate using natural mucoadhesive materials extracted from edible fruits like Zizyphus mauritiana and Aegle marmelos that have better mucoadhesive property than synthetic polymer hydroxypropylmethyl-cellulose K4M (HPMCK4M). The in vitro adhesive and mucoadhesive strength and swelling property of mucoadhesive materials extracted from edible fruits of Z. mauritiana and A. marmelos were evaluated and compared with HPMCK4M by Share stress and Wilhelmy plate method. Different formulations of oral mucoadhesive coated terbutaline sulphate tablets were prepared using these natural materials and HPMCK4M and hardness, thickness, friability, weight variation and assay of tablets were tested. The in vitro release of terbutaline sulphate was studied in buffer pH 7.2 at 37±0.5 C. The blood plasma concentration of terbutaline sulphate in rabbits was determined using HPLC. It was found that mucoadhesive materials extracted from edible fruits of Z. mauritiana and A. marmelos exhibited better adhesiveness and mucoadhesiveness as compared with the synthetic mucoadhesive agent HPMCK4M by different methods. The in vitro and in vivo drug release study of terbutaline sulphate exhibited extended drug release profile for tablets prepared with natural materials than synthetic polymers. After in vitro and in vivo correlation study, it was seen that both in vitro and in vivo drug release study showed the same release profile. The present study shows that natural mucoadhesive materials extracted from edible fruits of Z. mauritiana and A. marmelos have greater mucoadhesive property than HPMCK4M where both are used in the same amount. Mucoadhesion, or the attachment of a natural or synthetic polymer to a biological substrate, is a practical method of drug immobilization or localization and an important new aspect of controlled drug delivery . While the subject of mucoadhesion is not new, there has been increased interest in recent years in using mucoadhesive polymers for drug delivery [2, 3]. Substantial effort has recently been focused on placing a drug or a formulation in a particular region of the body for extended periods of time. This is needed not only for targeting of drugs but also to better control of systemic drug delivery . Drugs that are absorbed through the mucosal lining of tissues can enter directly into the blood stream and not be inactivated by enzymatic degradation in the gastrointestinal tract . Several polymeric bioadhesive drug delivery systems have been fabricated and studied in the past. Different types of bioadhesive synthetic polymers such as acrylic-based hygrogels  i.e. synthetic polymers such as carbopol 934,carbopol 937 and hydroxypropylmethylcellu-lose (HPMC) are also used to prepare oral mucoadhesive tablets . However, the adhesiveness and drug delivery capabilities of these devices can continue to be improved as presently known bioadhesive materials are modified and more bioadhesive materials are discovered [8-12]. Since the biodegradability of the synthetic polymers is questionable, some natural mucoadhesive materials extracted from edible fruits and vegetables having good mucoadhesive properties are used for this purpose . Terbutaline sulphate is widely used as an effective bronco dilator in the management of asthma . This is used as prophylactic drug as well as to prevent acute exacerbations of asthma. During acute attack of asthma it becomes difficult for a patient to take oral medications repeatedly. Hence, it is rational to administer terbutaline sulphate in a sustained release dosage form, which will minimize repeated administration of drug. Figure 1. Results of adhesiveness extracted from Zizyphus mauritiana (ZM), Aegle marmelos (AM) and HPMCK4M by Shear stress method. Weight required was average of three determinations (±SD). A 0.75% w/v solution of synthetic polymer and mucoadhesive materials in purified water was used. Terbutaline sulphate and hydroxypropyl-methylcellulose K4M (HPMCK4M) were gift samples from M/S Union Drugs Ltd, Kolkata. Acetone GR, talc IP and magnesium stearate IP were procured from M/S Loba Chemicals, Mumbai. Dihydrogen potassium phosphate LR, sodium hydroxide LR, concentrated hydrochloric acid LR and dibasic calcium phosphate (commercial grade) were purchased from Process Chemical Ltd, Kolkata. Monobasic potassium phosphate LR and Pancreatin were procured from E. Marck (India) ltd, Mumbai. Terbutaline sulphate RS was collected from Central Drug Laboratory, Kolkata. The fruits of Zizyphus mauritiana Lam. and Aegle marmelos (Linn.) Cor. were purchased from local market. The mucilage from above materials was extracted following method of Rao et al. with little modifications. In this method, 250 g edible fruits of Z. mauritiana and A. marmelos were soaked in double distilled water and boiled for 5 h in a water bath until slurry was formed. The slurry was cooled and kept in refrigerator overnight so that most of the undissolved portion was settled out. The upper clear solution was decanted off and centrifuged at 500 rpm 20 min. The supernatant was concentrated at 60 C on a water bath until the volume reduced to one third of its original volume. Solution was cooled down to the room temperature and was poured into thrice the volume of acetone by continuous starring. The precipitate was washed repeatedly with acetone and dried at 50 C under vacuum. The dried material was powdered and kept in a desiccator. Natural mucoadhesive material obtained from the fruits of A. marmelos [16-18] and Z. mauritiana [19, 20] are nontoxic. Each 250 mg of natural bioadhesive materials and HPMCK4M was allowed to hydrate in 25 ml of distilled water at 25 C in a 25 ml graduated cylinder. The volume of the natural bioadhesive materials and HPMCK4M measured at 5 min. intervals until there was no further hydration observed. Swelling property of different mucoadhesive polymer and materials were checked in different pH . Figure 2. Results of mucoadhesiveness extracted from Zizyphus mauritiana (ZM), Aegle marmelos (AM) and HPMCK4M by Wilhelmy plate method. Weight required was average of three determinations (±SD). A 0.75% w/v solution of synthetic polymer and mucoadhesive materials in purified water was used. Two smooth, polished plexi glass blocks were selected; one block was fixed with adhesive 'Araldide' on a glass plate, which fixed on leveled table. To the upper block a thread was tied and the thread was passed down through a pulley. At the end of the thread a beaker was fixed. The length of the thread from pulley to beaker was 7 cm. The weight of the beaker was counteracted. A 0.75% w/v solution of natural mucoadhesive materials extracted from the fruits of Z. mauritiana and A. marmelos and HPMCK4M was prepared using purified water i.p. as solvent. A fixed volume (0.5 ml) of 0.75% w/v solution of HPMCK4M and natural bioadhesive material solutions of Z. mauritiana and A. marmelos were kept on the centre of the fixed block with a pipette, and then second block was placed on the first block and pressed by applying 100 g of weight, so that the drop of synthetic polymer and natural bioadhesive material solutions spreads as a uniform film in between the two blocks. After keeping it for a fixed time intervals of 5, 10, 15, and 20 min., purified water was added into the beaker gradually, the weight of purified water just sufficient to pull the upper block or to make it slide down from the base block was recorded. This weight was considered as the adhesion strength, i.e. shear stress required to measure the adhesion. Before every experiment, care was taken so that no air bubble form in between the two blocks, which may give erratic results, and the distance from pulley to glass block was always same in all observations. In this method small glass plates were coated uniform by synthetic polymer and natural bioadhesive material solution to be tested and dried at 60 C. The prepared coated plates were immersed in goat intestinal mucus solution (pH=5.5), or USP simulated intestinal fluid (pH=6.0), or USP simulated gastric fluid (pH=1.2), for 5, 10, 15, and 20 min., at room temperature. The force required to pull the plate out of the solution was determined under constant experimental conditions . Figure 3. Release profiles of mucoadhesive tablets of terbutaline sulphate. Average of the three dimensions (±SD). Only batches F1 and F2 released drug up to 12 h. In case of other batches total amount of drug was released before 12 h.
Table 1: Determination of swelling property of natural mucoadhesive materials and HPMCK4M. Natural mucoadhesive materials (250 mg) and HPMCK4M (250 mg) were passed through sieve no. 60 and 25 ml measuring cylinder was used for this experiment. where, Dt is total dose (non-sustained loading dose which is equal to 2 mg in case of terbutaline sulphate); DI (corrected) is the corrected form of non-sustained loading dose required to achieve initial blood level, and Dm is the maintenance dose; K1 is elimination rate constant which is equal to 0.693/ t½, where t½ is the biological half-life of the drug; Wo is the initial dose required to produce desired biological activit; tp is time required for the onset of action which is equal to one hour in case of terbutaline sulphate; and h is duration (hours) for which sustained action is desired . Mucoadhesive coated tablets, each containing 7.5 mg of terbutaline sulphate, were prepared by conventional wet granulation method employing part of the mucoadhesive materials as filler and part of the natural mucoadhesive materials and HPMCK4M as binding agent as per the formulae given in Table 2. A blend of all ingredients was granulated with water. The wet masses were passed through 12-mesh sieve and the resulting granules were dried at 60 C for 24 h. The dried granules were passed through 18-mesh sieve. After blending with talc and magnesium stearate in a laboratory cube blender for 10 min., they were compressed into 100 mg tablets to a hardness of 4-5 kg/cm2 on a single punch tablet machine. All the prepared tablets were coated with 1% w/v aqueous solution of natural mucoadhesive materials and HPMCK4M and then evaluated for hardness, friability, average weight and disintegration time. The spectrophotometric method based on the measurement of absorbance at 276 nm in phosphate buffer of pH=7.4 was used for the identification of terbutaline sulphate. Terbutaline sulphate was assayed by HPLC method  using a 276 UV detector and a 4.6 mm×25 cm column that contains 5 mm packing LI. The flow rate was about 1 ml/min. The mobile phase was used as a mixture of ion-pair solution and methanol (77:23). Terbutaline sulphate USP RS was used as standard. Figure 5. Relationship between percent terbutaline sulphate released in-vitro and absorbed in-vivo for batch F1. Table 2.Formulations of coated tablets of terbutaline sulphate. Release of terbutaline sulphate from the mucoadhesive coated tablets was studied in phosphate buffer of pH=7.2 (900 ml) as prescribed in the dissolution rate test of terbutaline sulphate tablets in USP XXIV (method A) using USP Apparatus II by the rotation of the paddle at 100 rpm. Samples were withdrawn through a filter (0.45 μm) at different time intervals, suitably diluted and assayed for terbutaline sulphate at 276 nm. Drug release experiments were conducted in triplicate . Six health male albino rabbits weighing between 2.5-3.0 kg were fasted overnight. The oral terbutaline sulphate tablets (7.5 mg) were administered to rabbits. At determination time intervals, 1 ml blood samples were withdrawn from the marginal ear vein. The serum was subsequently separated, and in order to limit degradation, serum samples were stored at 0 C. The samples were analysis through HPLC and drug plasma concentration was computed using Kinetica 2000 Verson 3.0 (InnaPhase Corporation, USA). The Institutional Ethics Committee has approved and given the permission to conduct the in vivo study using healthy rabbits. Terbutaline sulphate was separated from serum samples through liquid-liquid extraction, by buffering with phosphate buffer pH=7.2, obtained with chloroform. The chloroform layer was separated and mixed with 0.5 M hydrochloride chloride acid. The aqueous layer was then separated by centrifuge and analysed. The amount of terbutaline sulphate was determined using HPLC containing hypersil ODS column (4.6×150 mm) with UV detector (Waters 2487 dual 1 absorbance detector) . Figure 6. Relationship between percent terbutaline sulphate released in-vitro and absorbed in-vivo for batch F2. In vitro-in vivo correlation was evaluated using Level A Correlation . This level of correlation is the highest category of correlation and represents a point-to-point relationship between in vitro dissolution rate and in vivo input rate of the drug from the dosage form . The swelling property of natural mucoadhesive materials extracted from the fruits of Z. mauritiana and A. marmelos and synthetic polymer HPMCK4M was studied in buffer of pH 5.5, 6.5 and 7.5 and swelling capacity was determined at different time intervals (Table 1). The results obtained from shear stress, and Wilhelmy plate method for natural mucoadhesive materials and HPMCK4M with different contact time were presented in Figures 1 and 2. The experiments were performed thrice and the average values are reported. Mucoadhesive materials extracted from fruits of Z. mauritiana exhibited better adhesiveness (18 g) after 20 min. from initial in shear shress method followed by natural materials from the fruits of A. marmelos (17.6 g) and HPMCK4M (9.6 g). In Wilhelmy plate method materials from the fruits of Z. mauritiana exhibited 25.6 g after 20 min. using USP simulated intestinal fluid followed by materials from the fruits of A. marmelos (25.3 g) and HPMCK4M (16.3 g). The disintegration test of tablets prepared and coated with mucoadhesive materials was performed in purified water i.p., in 0.1(N) HCl and in buffer of pH=7.2. Hardness of the tablets was found in the range 4-5 kg/cm2. Percentage weight loss in the friability test was found less than 0.1% in the all batches. The tablets in all batches contained terbutaline sulphate within 100±2% of the labeled content. Overall the prepared tablets were of good quality with regard to hardness, friability, and drug content. The results of in vitro drug release studies of different batches are depicted in Figure 3. The formulation with natural mucoadhesive material extracted from the fruits of Z. mauritiana in 1:1 drug-mucoadhesive material ratio (Formula F1) exhibited the extended cumulative percentage of drug release value (95.5%) after 12 h followed by A. marmelos (95.85%). Other formulation did not show the results of drug release upto that extend. Serum terbutaline concentrations and standard deviations achieved are shown graphically in Figure 4. The blood sample was withdrawn at 30 min. intervals. Batches A and B showed greater Cmax values compared to other batches. Mucoadhesive materials do not interfere the release and absorption of terbutaline sulphate and at the same time promote the retention of order units in the GI tract. A good correlation between the dissolution profiles bioavailability was observed. The relationship between percent drug released and percent drug absorbed is illustrated in Figures 5 and 6. Table 1 represented the swelling property of HPMCK4M and mucoadhesive materials obtained from Z. mauritiana and A.marmelos From these results, it was confirmed that swelling property of HPMCK4M is maximum followed by the material extracted from the edible fruits of A. marmelos and it was minimum for the materials extracted from the edible fruits of Z. mauritiana. The results obtained from Shear stress (Figure 1) and Wilhelmy plate method (Figure 2) confirmed that the mucoadhesive materials extracted from the fruits of Z. mauritiana and A. marmelos showed better adhesive and mucoadhesive property than the synthetic polymer HPMCK4M. The adhesive and mucoadhesive strength of this synthetic polymer and natural mucoadhesive materials was increased with time and it was maximum in case of material extracted from fruits of Z. mauritiana and minimum in case of HPMCK4M. The desired sustained release rate for all the batches followed zero order kinetic after a lag time of 1.0 h and up to 95.5% was released and gave slow release over a period of 12 h for the tablets of terbutaline sulphate prepared by natural mucoadhesive materials obtained from the fruits of Z. mauritiana and A. marmelos in 1:1 drug-polymer ratio (batch F1 and F2; Figure 3). The extension of release time is greater for these tablets than for tablets prepared by HPMCK4M in the same drug-polymer ratio (batch F3). Tablets prepared by the natural mucoadhesive materials in 1:2 drug: mucoadhesive materials ratio (batch F4 and F5) showed extended release over a period of 11 h. Total of about 95% drug was released at that period and this extension of release time is also greater than the tablets prepared by HPMCK4M (10 h) in the same drug-polymer ratio (batch F6). This might be due to slow and continuous supply of terbutaline sulphate at a desirable rate. The drug release rate was suggested by Wagner . Based on this release rate, an oral control release of terbutaline sulphate should extend up to 12 h containing total dose of 7.5 mg. The blood serum concentration obtained from batch F1 and batch F2 (Figure 4) which were prepared from natural mucoadhesive materials were sustained and exhibited a smooth and extended absorption phase as observed with other batches. Batch F1 and Batch F2 showed the Cmax at 12 h followed by other batches. The data generated in the present investigation indicated that the absorption of terbutalilne sulphate from gas-trointestinal tract may depend mostly on the release rate. A direct correlation between the dissolution profiles of batch F1 and batch F2 (Figures 5 and 6) with the relative bioavail-ability of the formulations could be observed. These two batches have a much slower but continuous absorption as compared to other batches. Short-term stability studies (at 40 C for 6 months) of the formulations F1 and F2 was carried on as per ICH guidelines  and it was confirmed that the tablets were stable with respect to drug content. IR spectroscopic studies indicated that there was no drug-excipient interaction. In conclusion, the results of the present study indicated that the formulation F1 which was prepared from the mucoadhesive materials extracted from the edible fruits of Z. mauritiana and used in 1:1 drug: material ratio and the formulation F2 which was prepared from the mucoadhesive materials extracted from the edible fruits of A. marmelos and used in 1:1 drug: material ratio have shown promising results (released about 95.5% of the drug in 12 h) with reasonably good mucoadhesive properties of natural materials. Peppas NA, Moniga NK, Hung Y, Dekker M. Handbook of pharmaceutical controlled release technology. New York: Marcel Dekker INC, 2005; pp. 236-47. Marriott C, Gregiry NP. Mucus physiology and pathology. In: Enaerts V, Gurny R, (editors). Bioadhesive drug delivery systems. Boca Raton: CRC Press, 1990; pp. 1-24. Marriott C, Hughes DRL. Mucus physiology and pathology. In: Gunny R, Junginger HE, (editors). Bioadhesion-possibilities and future trends. Stuttgart: Wissenschaftliche Verlagsgesellschaft mbH: 1990; pp. 29-43. Gandhi BR, Robinson JR. Bioadhesion in drug delivery. Ind J Pharm Sci 1988; 50: 145-52. Langer RS, Peppas NA. New drug delivery systems. BMES Bull 1992; 16: 3-7. Duchene D, Touchard F, Peppas NA. Pharmaceutical and medical aspects of bioadhesive systems for drug administration. Drug Dev Ind Pharm 1988; 14: 283-318. Khanna R, Agarwal SP, Ahuja A. Mucoadhesive buccal drug delivery: A potential alternative to conventional therapy. Indian J Pharm Sci 1998; 60: 1-11. Gurny R, Meyer JM, Peppas NA. Bioadhesive intraoral release systems: Design, testing and analysis. Biomaterials 1984; 5: 336-40. Achar L, Peppas NA. Preparation, characteriza-tion, and mucoadhesive interactions of poly (methacrylic acid) copolymers with rat mucosa. J Control Release 1994; 31: 271-96. Peppas NA, Moniga NK. Ultrapure poly (vinyl alcohol) hydrogels with mucoadhesive drug delivery characteristics. Eur J Pharm Biopharm 1997; 43: 51-8. Ascentiis DA, Colombo P, Peppas NA. Screening of potentially mucoadhesive polymer microparticles in contact with rat intestinal mucosa. Eur J Pharm Biopharm 1995; 41: 229-34. Hoffman AS, Chen G, Wu X, Ding Z, Kabra B, Randeri K, Schiller M, Ron E, Peppas NA. Graft copolymers of PEO-PPO-PEO triblock polyethers on bioadhesive polymer backbones: Synthesis and properties. Polym Prepr 1997; 38: 524-5. Khullar P, Khar RK, Agarwal SP. Evaluation of guar gum in the preparation of sustained-release matrix tablets. Drug Dev Ind Pharm 1998; 24: 1095-9. Hoffman BB, Lefkowitz R. Catecholamines, sym-pathomimetic drugs, and adrenergic receptor antagonists. In: Hardman JG, Limbird LE, (editors). Goodman and Gilman's pharmacolog-ical basis of therapeutics. New York: McGraw-Hill, 2001; pp.198-14. Rao PS, Srivastava HC. Industrial gums. New York: Academic Press, 1973;126-37. Jagetia GC, Venkatesh P. Radioprotection by oral administration of Aegle marmelos (L.) Correa in vivo. J Environ Pathol Toxicol 2005; 24: 315-32. Badam L, Bedekar SS, Sonawane KB, Joshi SP. In vitro antiviral activity of bael (Aegle marmelos Corr) upon human coxsackieviruses B1-B6. J Commun Dis 2002; 342: 88-99. Arseculeratne SN, Gunatilaka AA, Panabokke RG. Studies of medicinal plants of Sri Lanka. Part 14: Toxicity of some traditional medicinal herbs. J Ethnopharmacol 1985; 13: 323-35. Aritajat S, Kaweewat K, Manosroi J, Manosroi A. Dominant lethal test in rats treated with some plant extracts. Southeast Asian J Tropical Med Public Health 2000; 1: 171-3. Rao YM, Vani G, Bala R, Chary R. Design and evaluation of mucoadhesive drug delivery systems. Drug Dev Ind Pharm 1998; 35: 558-65. Nath LK, Sharma SN. Formulation of sustained release dosage form of bromhexine hydrochloride. Eastern Pharmacist 1991; 404: 145-8. The United States Pharmacopoeia. Rockville:The United States Pharmacopoeial Convention Inc, 2005; pp. 2861. Narendra C, Srinath MS, Rao BP. Formulation and evaluation of a sublingual tablet containing terbutaline sulphate: Optimization and in vivo studies. Ars Pharm 2005; 46: 139-58. Emami J. In vitro-in vivo correlation: From theory to applications. J Pharm Pharmaceut Sci 2006; 9: 169-89. Wagner JG. Biopharmaceutics and relevant phar-macokinetics. Chicago: Drug Intelligence Publications, 1971; pp. 164-78. The United States Pharmacopoeia and National Formulary. Easton: Marck Publishing Co, 2004; pp. 1114-9.